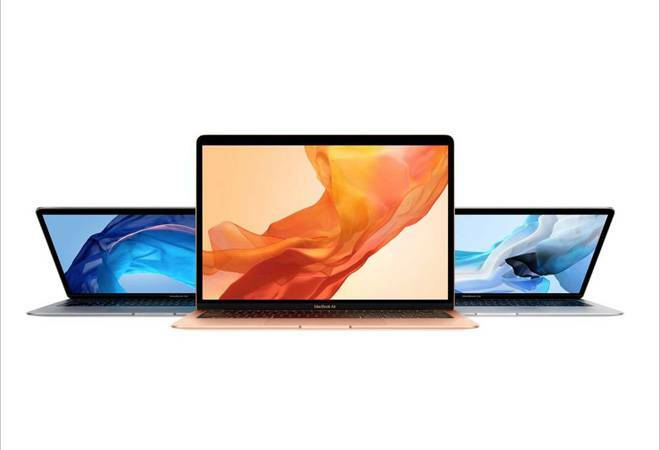 One of the most preferred on-the-go computing devices - MacBook Air - has finally received some incremental updates that users have been longing for long. The new Air 2018 features minimal design upgrades along with an improved Retina display and new processor for faster performance. Design & Ports: Apple has an art of designing good-looking products and the MacBook Air 2018 only confirms the same. The new Air is a real looker. It has got a premium look and feel. It is at par with the latest MacBook Pro in terms of design. The finish feels so premium that it's hard to believe that the new Air has been crafted from a single block of recycled aluminium. Moreover, the new gold colour looks stunning. It's not a shimmery gold but one with a darker tone, resembling (to me) the Rose Gold on the iPhone 6S Plus. MacBook Air continues to have a tapered design with the thickest point at 15.6mm coming down to 4.1mm. In all, it feels light at 1.25 kgs. The minimalistic yet elegant design houses two Type C ports with Thunderbolt 3 on the left and 3.5mm audio port on the right. Two Type-C ports might feel less, considering one will be used for charging as well. Even though an increasing number of devices are adopting Type-C port, in a real-life scenario, you will still need USB ports for connecting pendrive, charging cables and more. If so, it would be wise to invest in Type C to a USB connector or a Portronics MPort7C hub with multiple ports (including a card reader, HDMI port, USB ports). Display: There have been some significant improvements on the display front as well. Apple has done away with the aluminium bezels by adopting a glass-to-glass edge screen running to the edges. As a result, the borders are 50 per cent thinner than before. Sides of the display are done in black that not just complements the design but even the content looks immersive. Be it videos, images or presentation, everything in the full-screen view appears seamless without any distractions. The 13.3-inch Retina display with 2560x1600p resolution is sharp and vibrant, supports a wide colour gamut and wide viewing angles. MacBook Air houses the third-generation butterfly mechanism keyboard (same as on the MacBook Pro) with individual backlit keys along with a force touch glass trackpad. The keyboard was super comfortable to type upon and I was able to adjust the keyboard backlight using the dedicated shortcut keys (f5 and f6). Apple might have ditched the Touch ID sensor from the new iPhones and iPad but has retained one for the MacBook range. On the top right corner, next to the F12 key, is the touch ID sensor that I was able to use for security, unlocking the machine, accessing password-protected documents, folder and more, without having to enter the password. While it came in handy to wake-up Air from sleep, I had to enter the password every time it booted. Just below the keyboard is the large Force Touch trackpad that supports gestures (swiping fingers) for easy and quick navigation across the system, switching between the apps, going back to previous and next page on Safari and more. It even supports Force Touch (borrowed from MacBook Pro) for accessing more options based on subtle differences in pressure. For instance, Force Touch instantly looked for meaning and synonyms of the word in Pages, opened location on Maps when used on the address in the email, and more. The speaker grills on the sides of the keyboard offer immersive sound. Performance: For the MacBook Air, Apple has opted eight-generation Intel i5 processor clocked at 1.6GHz, which are power efficient. The entry-level machine (starting at Rs 1,14,900) comes with 8GB of RAM, fast 128GB SSD, and runs on the latest macOS Mojave specially designed for Mac range. This machine is a powerhouse when it comes to performance and was able to use it for multitasking, gaming, editing images and videos, on the move. I was able to download applications from the dedicated App Store for Mac. For the software that was not listed on the App Store, I was able to download the Mac version directly from the website. This includes Microsoft Office 365 and Opera browser. With security Apple's top priority, the Air also comes with a T2 security chip that encrypts data and ensures secure boot. It even has three microphones for enhanced conversations with Siri, which I often used for searching documents, launching applications and even loading a particular website on Safari browser. During testing, there wasn't a single instance when the Air struggled to perform. But if you need more power for heavy-graphic work and video editing all the time, it might not be able to live up to your expectations. Battery: Apple has bundled a 30W wall-charger in the box that manages to juice up the Air in just over a couple of hours. The single full charge lasted me over eight hours with documentation, web browsing with numerous windows opened across Safari and Opera, video streaming over YouTube, image editing (typically what is a full day's work for me) at full brightness and WiFi connectivity. I could easily leave the charger behind, without worrying about the Air's battery.